I like the Shu Uemura UV Underbase Mousse because of how incredibly impressive it makes makeup stay all day despite the sweltering heat. I have combination skin and I prefer swiping the lightweight mousse primer along my T-zone area only as it tends to dry up my cheeks. Talk about a genuine face mattifier! This can be a stand alone face base for those with already great skin (not for those with dry skin though). The primer is limited to gluing foundation to the skin, blurring pores to a significant degree, and keeping the face from excessively oiling up. It cannot conceal acne scars and pimples. mousse pump difficult to control (the bottle dispenses too much when all you need is a small dollop). To get the right amount, make sure to press the pump on its farthest side opposite the nozzle. Pump cautiously (the sneaking-in-the-house-way-past-your-curfew cautious type) in an upward direction. The shades do not adapt to the skin color and tone. I remember my face looking beige and afloat my neck after putting this on. Its color does not overpower the foundation shade that sits on top of it though. I thought the Shu Uemura UV Underbase mousse primer smelled like beer. You get a velvety smooth face after letting the product sink in to the skin. Limited edition bottles are purely beauty blings and are in no way extra special inside than the regular bottles. Product wastage captured in photo (below). This is what happens when you treat the pump as you normally would a pump--pressing it on the middle. You will only need half as much to cover the entire face. And if you're arguing that you can use the remaining half to build coverage, don't be disappointed when you end up looking a lot more beige than covered. Recommendation. Those who have oily skin with minor imperfections will enjoy this product. Makeup artists may also find this a reasonably priced primer--cutting down on touch-ups and beauty boo-boo's during events is after all, priceless. I also recommend this to those who feel like they will never find a face primer that will make foundation stick. 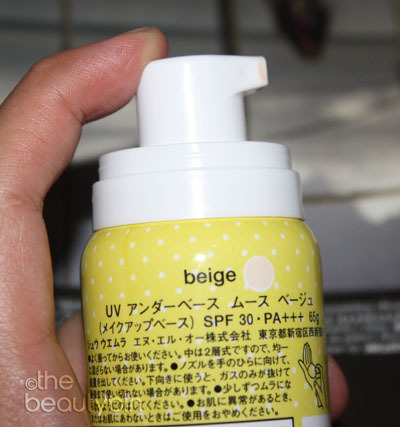 This product is worth trying before totally giving up on primers. Despite the efficiency of the product, it is surprising that I rarely want to use it. The Shu Uemura UV Underbase mousse primer makes me look too made-up (for my liking). I can use it on its own to downplay the look but it lacks decent coverage to give my face the near-flawless illusion it needs. 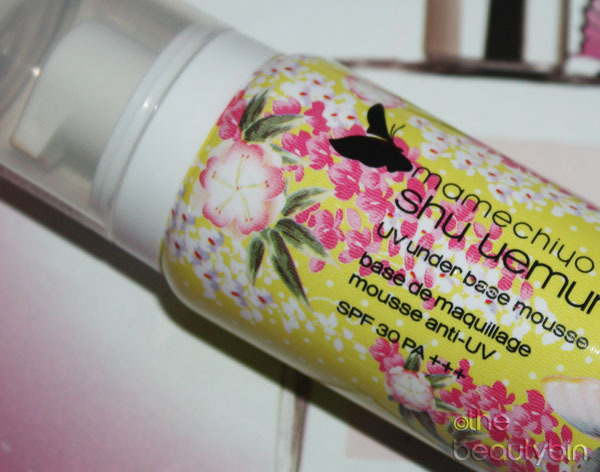 This is one of my favorite products from Shu ♥ nice post! I love your blog! Specially the photos because they are so detailed and clear, I can really understand about your post. I followed you on GFC! Maybe you can come by mine too and maybe follow each other? :) Thank you for this post! I can't wait to read more of your posts. More power to you! Hi Argie! I miss your posts. Hope you're doing great. Hey argie. Hope you write again soon. *sigh* My skin needs all the help it can get...lol. Guess I won't be trying this out. Hmmm...interesting. I am thinking of trying it out. It seems like a great product to try out based on your review.